Hearts centre-half John Souttar and Hibs left-back Lewis Stevenson have been called into the Scotland squad for the first time. Souttar, 21, and 30-year-old Stevenson have been included in manager Alex McLeish’s 24-man group for the friendlies against Peru and Mexico. 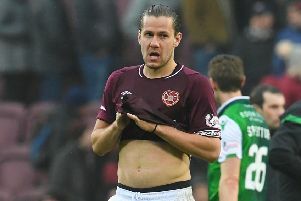 Hearts are also represented by goalkeeper Jon McLaughlin, while Hibs’ midfield duo Dylan McGeouch and John McGinn have been picked. There is, however, no place for Tynecastle skipper Christophe Berra. The 33-year-old centre-half was a mainstay in the national team under previous boss Gordon Strachan, but has been omitted for a second time by McLeish. Scotland take on Peru on Tuesday, May 29 in Lima before travelling to the Azteca Stadium to play Mexico on Saturday, June 2.